October and November were a doozy - I lost count of the numbers of trains I sat on and flights I caught, and luckily, I didn’t miss any of them! I was bummed to be missing out on the vivid, seasonal colors in DC as I jetted from city to city, but my experiences in NYC, Long Island, Chicago, and New Orleans more than made up for the lost face time with my favorite rowhomes, all decked out in their fall wardrobes. Over the course of the month, one thing stood as an anchor: supper clubs. I’ll use supper club loosely here, but on five separate occasions, I gathered around a large table over a good meal, sometimes with strangers and sometimes with friends that felt just like family. For two of the five suppers, the locations were kept a secret until a day before the event. 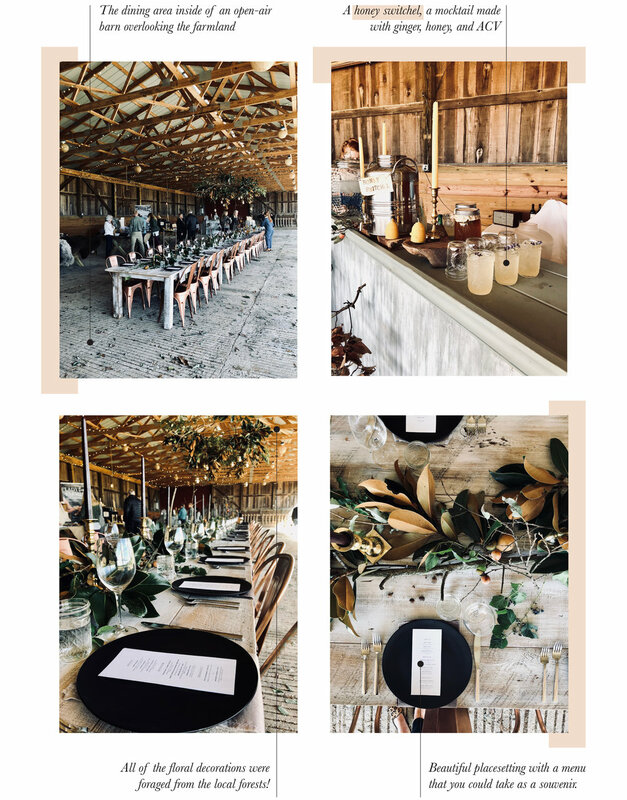 Read more for a quick recap of my experience at three of the dinners, as well as some links to where you can find other supper clubs happening in your area! The first stop on my little dining tour was a beautiful dinner hosted by local DC Supper Masterminds Makers Meals. They are on a mission to bring together creatives, makers, and artists, and each meal highlights the work of local artisans. During this meal, we heard from Claudia and Ellen, writers of Bread & Beauty, watched an indigo tutorial with Lady Farmer, and learned about honey with Banner Bees. We munched on fried polenta and sipped on Gold Rush Cocktails during the discussion, and for the meal, we enjoyed carrot salad, a lamb ragu and sweet potato gnocchi, and grilled lamb, all sourced from the farm. Each course was paired with a natural wine from Rockland’s, a local vineyard. After the meal, we gathered around a campfire and listened to a local banjo player strum away, even joining in for certain songs. The evening was a lovely memory, and I’m grateful that Makers Meals is based in DC so that I can enjoy another supper soon! I should preface this by noting that I bought my Secret Supper ticket a year before the dinner, not knowing where it was going to be or how I was going to get there. The trek for this dinner required three train rides and two ubers, and on an otherwise dewey Saturday evening, I arrived just in time for what was one of the most breathtaking dining experiences I’ve had. I love attending an event like this on my own - riding solo encourages you to reach out to new faces, and you never know who you might meet! Within the first thirty minutes, I met a couple that had a mutual connection at the firm where I work. I met a handful of other designers and creatives, and even an edible flower chef! My last meal was perhaps the most special. I had just flown in from New Orleans, lugged my suitcase over to Capitol Hill and managed to squeeze in an apartment tour, then showed up at Eastern Market right in time for the final preparations. This meal was hosted by Passion City Church DC for our House, our friends, and our families. It was an opportunity to come together and celebrate one another and celebrate the way God is working in this city! 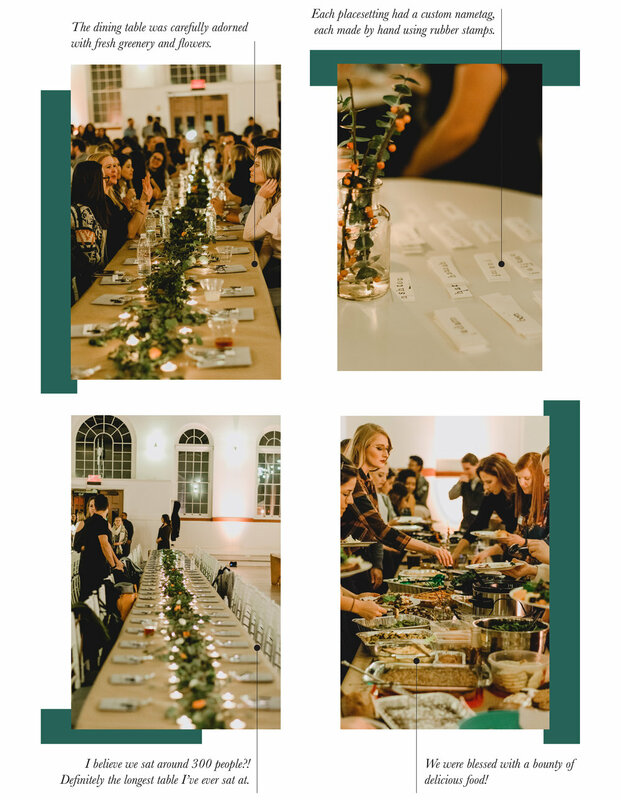 The Environment and Hospitality team completely transformed Eastern Market into a gorgeous, cozy home for the evening, and because it was a Friendsgiving, all of the guests brought a dish to share. We welcomed nearly 300 people, and were never short of food nor smiles! These pictures are from Sarah - thanks friend! Have you attended any supper clubs recently? Share the details to be featured in an upcoming post! If you are in the DC area, be sure to check out First Supper Club as well as Makers Meals. If you are not in the area, definitely sign up for the Secret Supper email list and check out Outstanding in the Field!